You are here : TrackDebris » Sprint Cup Series » If Dale were here today…. 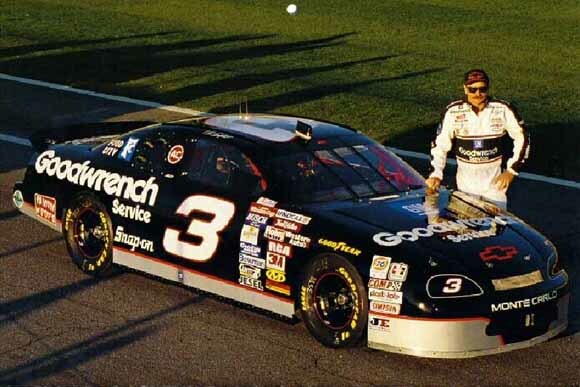 It’s hard to believe its been 10 years since we heard those heart breaking words from Mike Helton, “We have lost Dale Earnhardt.” It seemed impossible. Dale was an Iron Man. Tough as nails. He got the pole at Watkins Glen with a broken collar bone, sternum and shoulder blade. He drove a year with a broken vertebrae and a hand that often went numb. He tended his own farm, getting up at the crack of dawn to throw hay to his cattle and collect eggs from his chickens. A mans man. So the unbelievable was true. We lost Dale Earnhardt. For me, I found myself with tears streaming down my face in disbelief. I wondered, how can I be this upset and torn apart over man I never met. And if I am this ripped apart, how in the world is his family and friends coping? Then that thought tore me up all over again. He was a hero to everyone. It’s always amazing to me that one individual can have that much impact on a society. Many people say, you either loved him or you hated him. I tend to believe most people loved him. You may have gotten mad at him at times, but down deep, you really loved him. I believe the planet was a better place with him on it and I am proud to have witnessed his legacy. 4. We would have NEVER had the WING! 7. Dale Jr might even be married with kids by now – Ha ha! !